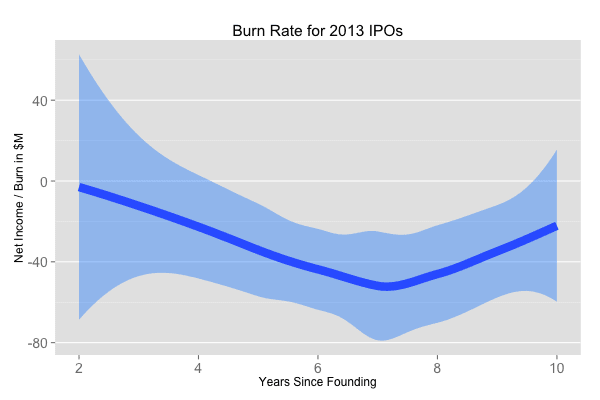 How much cash does a tech venture-backed company burn through before IPO? 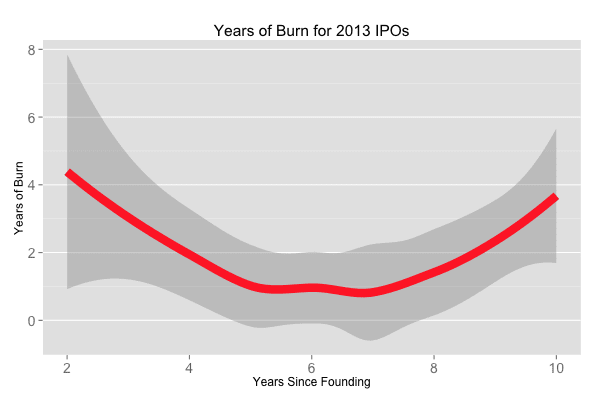 The median 2013 VC-backed tech IPO burned $33M and the average company burned $76M. 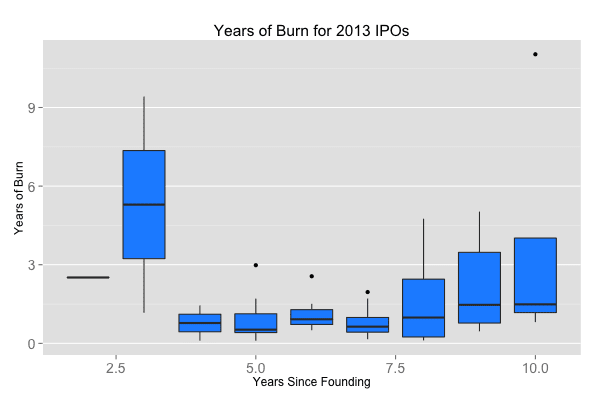 The chart above shows the net income/burn rate of 2013 tech IPO by years since founding. Four categories of companies jump out in the chart: the profit leaders, the middle-of-the-pack, the negative hockey stick, and the go-for-broke. The profit leaders, Veeva(VEEV) and RetailMeNot(SALE), have generated tremendous profits from the outset. The middle-of-the-pack companies, including Rally(RALY) and Tableau(DATA), burn no more than $25M annually. Some like Chegg(CHGG), RingCentral(RNG), Marketo(MKTO) and FireEye(FEYE) show reverse hockey-sticks - their burn is increasing at an increasing rate. And the go-for-broke contingent of WorkDay(WDAY), Twitter(TWTR), Gogo(GOGO), Violin(VMEM) and SilverSpring(SSNI) have exceeded the $100M burned in one year mark. In addition to the capital invested to become public, a startup must have cash on its balance sheet at IPO. The median company carried $32M and the average company carried $43M on its balance sheet before IPO. In total, the median startup raised $65M and the average startup raised $119M before IPO. Practically speaking, this likely means four rounds of financing for the IPO-bound startup: something like $5M Series A, $10M Series B, $25M Series C, $25M Series D in the median case. 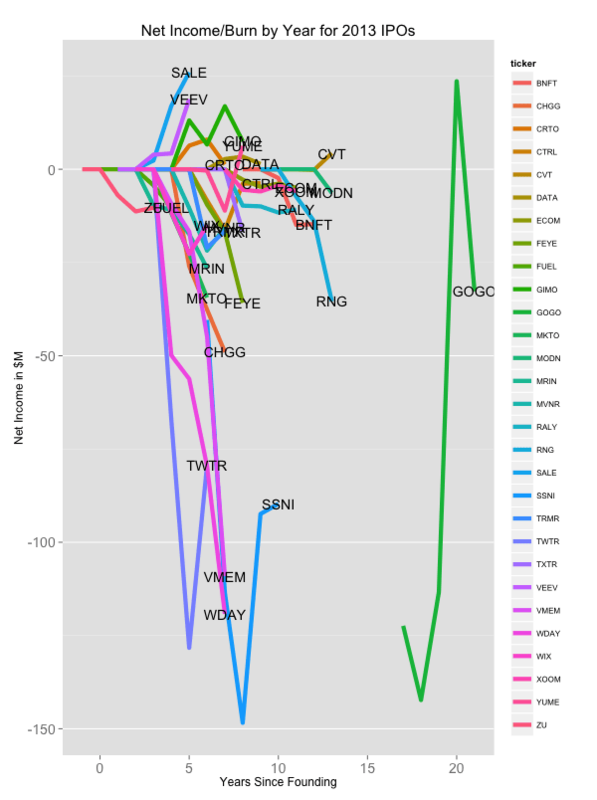 How much runway did the 2013 IPOs possess along the way? On average, these now-public names kept 1.1 years of runway in the bank. The chart above shows the smoothed trend across the 2013 IPO vintage. In the early days, the numbers are skewed by Zulily, the only company in the list to IPO 4 years after founding. Years 4 onward are much more representative, when the average company held about 9 to 15 months of cash. At the bottom of the post, I’ve included the box plot which shows these trends in more detail. 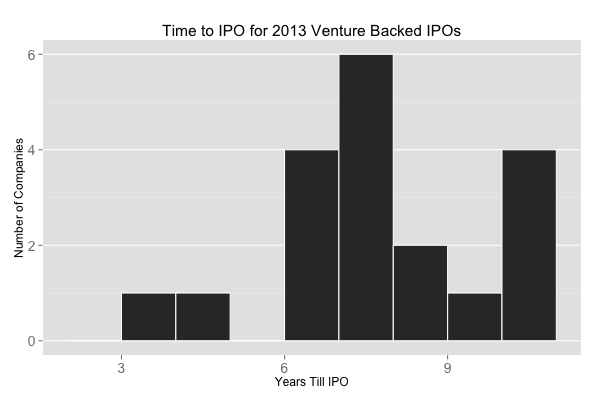 The typical 2013 VC backed tech IPO took seven years to become a publicly traded company. 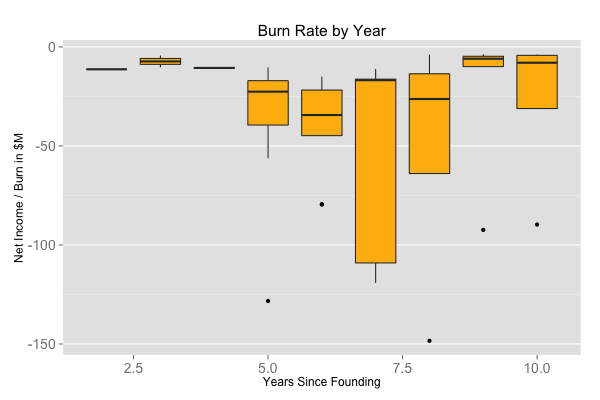 In the years immediately preceding their IPO, these companies increased their burn rates substantially from $5 to $10M in the first 3-4 years, then to about $25M in the 5th year and $40M in the 6th, before declining steadily after IPO. Below, I’ve included the box plots that provide more detail about each of these analysis and the histogram of time to IPO.